In 1985, Suzuki unleashed the GSX-R750 to the world, which would become the foundation for today’s sportbikes. With unmatched engineering feats in light weight frames and power, it made its race track debut with a stunning victory at The Le Mans 24-hour World Endurance Championships! 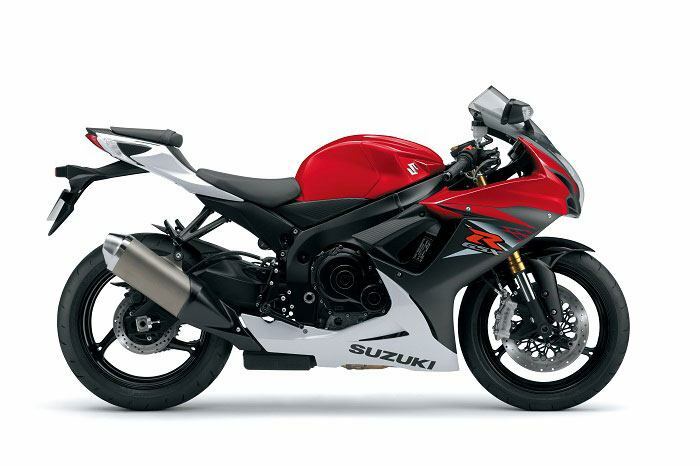 Suzuki has remained true to the GSX-R’s original concept with continued evolution for the GSX-R750. The GSX-R750 remains the best choice for riders who appreciate a state-of-the-art 750 cc engine combined with the compactness of a GSX-R600 cc Supersport. When you ride a GSX-R750 you experience the breathtaking combination of outstanding race winning heritage, engine performance, crisp handling, compact size and light weight. It's a winning combination that allows any rider to experience the exhilarating rush any time, any place, anywhere. Race-developed, lightweight 41mm Showa Big Piston front-Fork (BPF) delivers superb feedback and consistent performance. A lightweight and compact twin-spar aluminum cradle frame is made of five cast sections and features a cast swingarm. An electronically controlled steering damper provides lighter steering at lower speeds and more damping force at racetrack and highway speeds. A single Showa rear shock features externally adjustable rebound and compression damping, along with adjustable ride height. Advanced, MotoGP-developed transistorized ignition control circuit helps maintain more precise spark timing across the range of engine temperature. Suzuki Drive Mode Selector (S-DMS) offers push-button selection of three performance settings to suit riding conditions and personal tastes. The switch is located on the left handlebar control module. 3-way adjustable footpegs, adjustable shift lever, and short fuel tank help with a comfortable riding position. Compact, lightweight instrument cluster with a built-in lap timer/stopwatch and programmable engine rpm indicators. Analog tachometer. LCD readouts include speedometer, odometer, dual trip meter, reserve trip meter, clock, coolant temperature/oil pressure indicator, S-DMS and gear position indicators. A six-speed close-ratio transmission features vertically staggered shafts to reduce overall engine length.